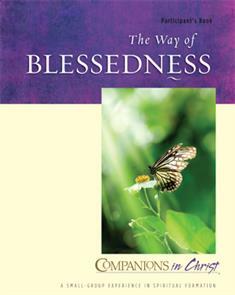 The Way of Blessedness Leader's Guide is also available. The Way of Blessedness invites readers to cultivate the dispositions of the soul as outlined in Jesus' Sermon on the Mount, which suit us for the reign of God while drawing us into its realm. Jesus portrays the reign of God in terms that are contrary to social hierarchy — in his time as well as our own. It is a realm of outlandish generosity and uncommon compassion. This is a 9-week study of the spiritual practices that help us turn away from pride and fill us with God's abundant love. As we're transformed by God's love, we're able to become people who mourn with and for others and our world, who understand and live out Jesus' example of meekness, who hunger and thirst for holiness, who humbly offer and receive mercy, whose hearts are pure and able to see the imprint of God in all things, who seek peace, and who hold strong in our faith through adversity. The Way of Blessedness guides participants along a path that offers clarity to our way of life and the very life of God's kingdom.